In this Aug. 19, 2017, file photo, a counter-protester holds a photo of Heather Heyer at a "Free Speech" rally organized by conservative activists in Boston, Massachusetts. 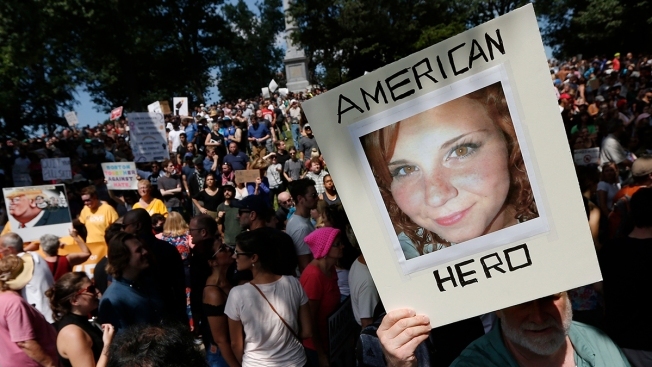 Jurors in the trial of a man accused of killing a woman and injuring dozens at a white nationalist rally in Charlottesville, Virginia, in 2017 are expected to hear closing arguments in the case after testimony from final defense witnesses. James Alex Fields Jr. is charged with first-degree murder and other counts for driving his car into a crowd of counterprotesters in Charlottesville on Aug. 12, 2017. Heather Heyer, 32, was killed.